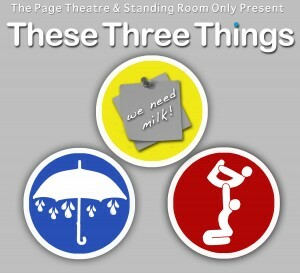 These three plays, produced by The Page Theatre and Standing Room Only, are strongly linked by their savagely funny depictions of relationships that have lasted just long enough to go sour. Throughout all of them however, there is the definite sensation that despite whatever problems couples have, there is an intrinsic love that remains, even if the relationship doesn’t. The three plays use this connection, along with a strong comedic spin and a touch of tragedy, to create a highly theatrical, yet innately truthful image of love; yes it is powerful, yet it is funny; yes it is cute, yet it is painful; yes it is sad…but then so are all of these plays. The plays are very different visually, but are united by that one thing that often unites people. After all, what else could bring acrobats, post-it notes and umbrellas together, but love?